Home Expert Advice Skincare Advice Eye Care What Are Undereye Bags? What Are Undereye Bags—and What Causes Them? Undereye bags are a stubborn, visible bulge beneath one or both eyes. They tend to feel “squishy” when touched and look worse if you habitually rub your eyes. 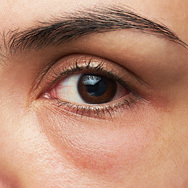 For most people, undereye bags are the same as puffy eyes, but research on what causes these concerns shows they differ. Undereye puffiness can occur at any age. It’s typically caused by allergies, diet (too much salt or alcohol, for example), or sleeping position. This type of puffiness goes away on its own or can be minimized with eye-area products like undereye gels. In contrast, undereye bags tend to occur as we age. The fat pads beneath the eyes shift downward, dropping beneath and protruding from the immediate undereye area. The result is puffiness that won’t go away no matter what eye bag remedy or treatment you try. If you have undereye bags and you’re younger than age 30, the cause is likely heredity. Some people inherit larger fat pads that naturally protrude underneath the eyes and then worsen with age. We discuss the best undereye bag treatments here. How do Undereye Bags Happen? When we’re young, the fat pads beneath the eyes are held securely in place. The passage of time, sun damage, and gravity cause the ligaments that normally anchor the fat pads in place to push outward, similar to a hernia beneath the skin. This shift of the fat pads usually happens gradually, but some people experience a sudden onset. In some cases, the undereye bags become larger, often bulging out over the top of the cheekbones (a type of eye bag known as a festoon or malar bag) before shrinking back to their normal size. This change in size and appearance is due to fluid retention, such as from allergies, sinus issues, or bad habits like smoking—but once again, heredity can play a role. Undereye bags can look worse when skin begins to sag and become thinner from sun damage--one more reason to protect eye-area skin with sunscreen and sunglasses all year long! You’ve likely tried undereye bag home remedies or store-bought eye creams claiming to eliminate the issue, only to find they didn’t work well, if at all, no matter how much they cost (talk about disappointing!). Sadly, remedies for undereye bags are not to be found in stores, on infomercials or home shopping channels, or in any DIY recipe. Some undereye bag remedies might temporarily tighten the skin or make it feel tighter (or constricted, which isn’t good for skin), but their effects are entirely superficial and short-lived. That’s because, despite the tempting claims, topical products cannot address what’s happening beneath the skin to cause the undereye bags—only cosmetic surgery can do that!